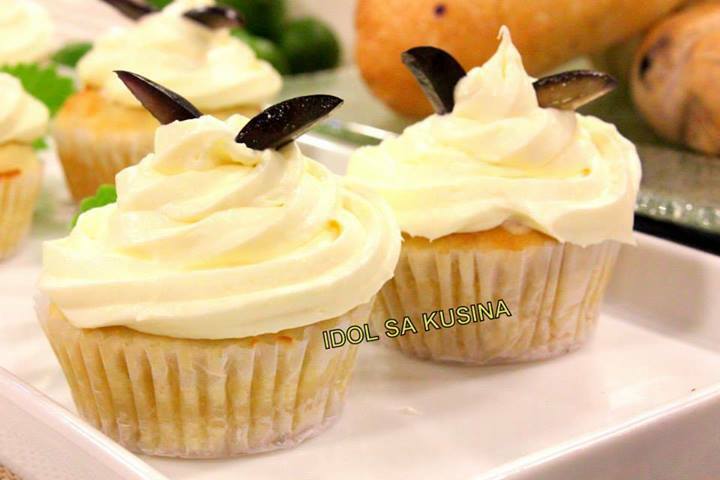 Here's Idol sa Kusina Recipe for Episode 98/June 23- KALAMANSI CUPCAKE WITH CREAM CHEESE FROSTING. 1. Heat oven to 400°F (205°C). Grease bottoms only of 12 muffin cups or line with baking cups. 3. Fill cups 2/3 full. Bake for 20 to 25 minutes or until toothpick inserted in center comes out clean. Cool before topping with the frosting. 4. For the frosting, beat together the butter and cream cheese with an electric mixer. With the mixer on low speed, add the powdered sugar a cup at a time until smooth and creamy. Beat in the vanilla extract. 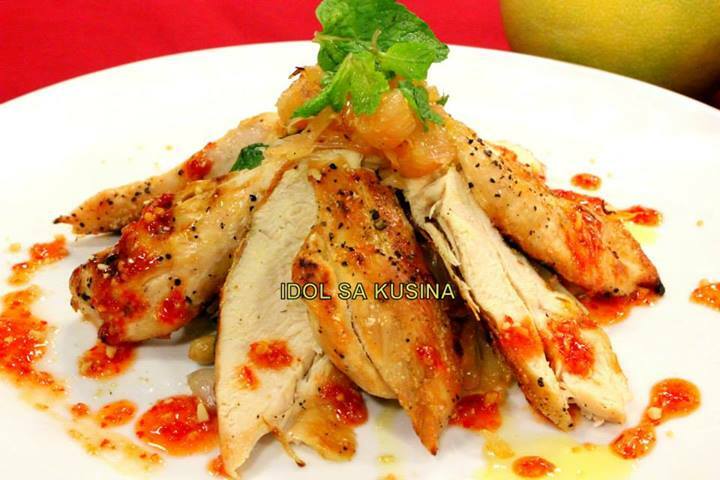 Here's Idol sa Kusina Recipe for Episode 98/June 23- POMELO AND CHICKEN SALAD. Mix together ingredients for sauce. Set aside. Season chicken with salt and pepper, then grill. Set aside. In wok or sauté pan, cook shallots and garlic until shallots are caramelized, about 3 minutes. Then toss with cucumber, pomelo and carrots. Add mint, chopped peanuts, and dressing; and toss well. Transfer to a plate or large bowl and serve. 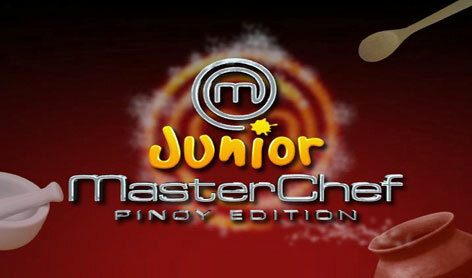 Here's Idol sa Kusina Recipe for Episode 98/June 23- MAGIC MIXED VEGGIES WITH CREAMY ORANGE DRESSING & MAYO PEARLS. 1. Season fish with salt and pepper, dredge in flour, egg, then breadcrumbs. Deep fry until golden. Set aside. 2. Meanwhile, heat water and add gelatin. When dissolved, add into mayonnaise and let it chill to set. 3. Use melon baller to make pearl shapes. 4. 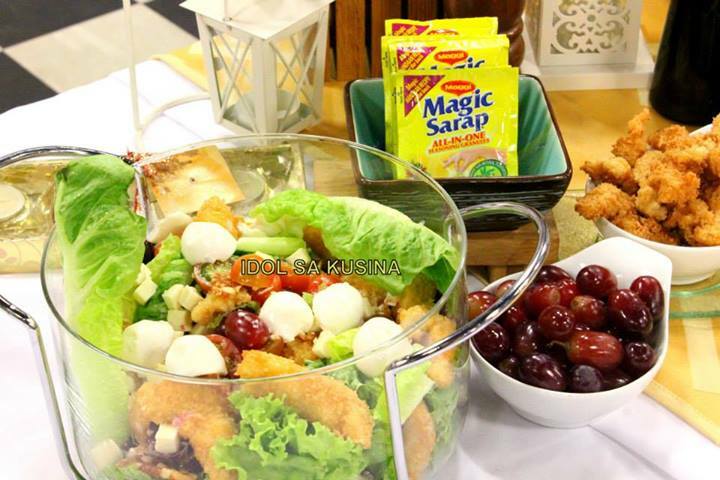 Toss the lettuce, grapes, kesong puti, peanut brittle, cherry tomatoes and fish fillets with the citrus dressing and top with the mayonnaise pearls. 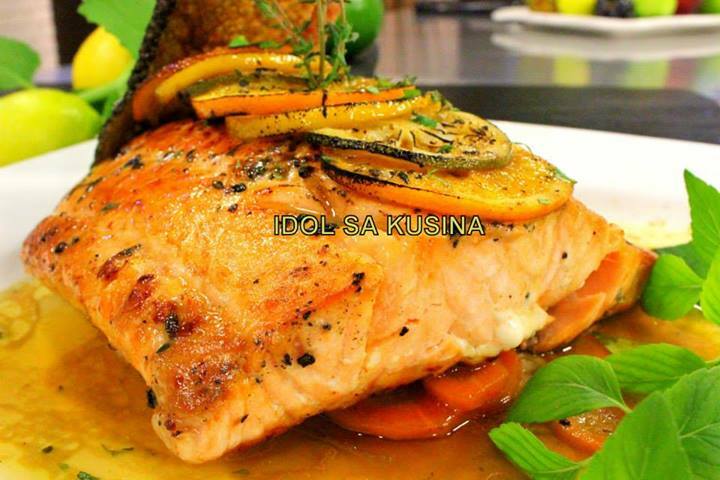 Here's Idol sa Kusina Recipe for Episode 98/June 23- TRI-CITRUS BAKED SALMON WITH CRISPY SKIN. 1. Season salmon with thyme, salt and pepper. 2. 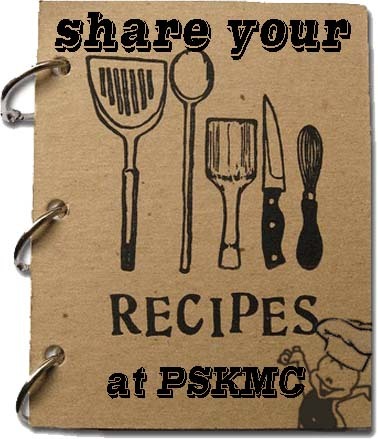 In a baking dish or roasting pan, place onions, carrots and button mushrooms. 3. Place the salmon and then butter slices and the lemon, lime and orange slices. 4. Drizzle with olive oil and bake until done. 5. Fry the salmon skin and season with salt and pepper. 6. Top the fish with crispy salmon skin and serve with roasted vegetables. 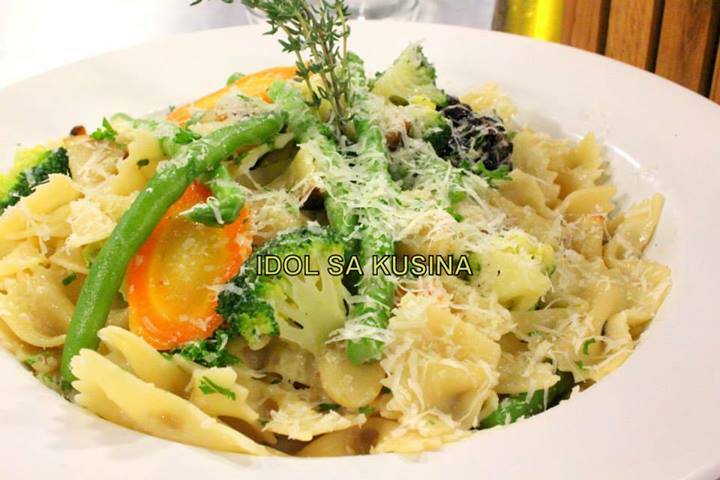 Here's Idol sa Kusina Recipe for Episode 97/June 16- BOWTIE PASTA WITH VEGETABLES AND ROASTED GARLIC. 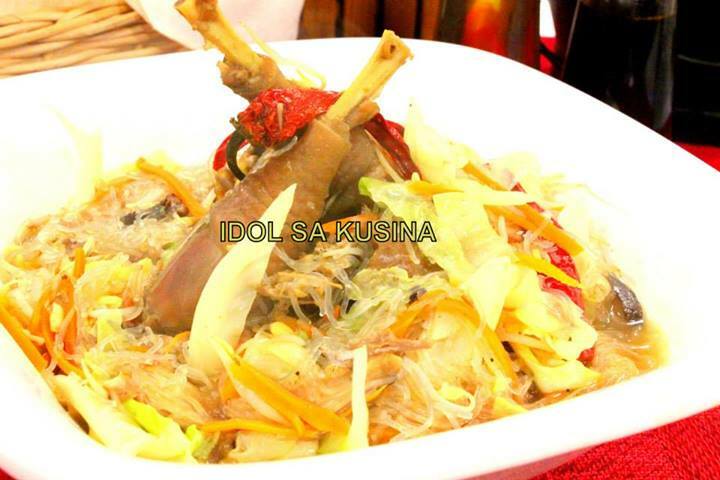 Here's Idol sa Kusina Recipe for Episode 97/June 16- NATIVE CHICKEN WITH SIBUT. 1. Heat oil in big pot. Saute ginger and garlic until fragrant. Add chicken pieces until browned. 2. Add the water and boil. 3. Add sibut, mushroom, dried chili and carrots and simmer for 2 hours until meat is very soft and tender. Season with salt and pepper. 4. Place vermicelli on a bowl then top with chicken and then the soup. 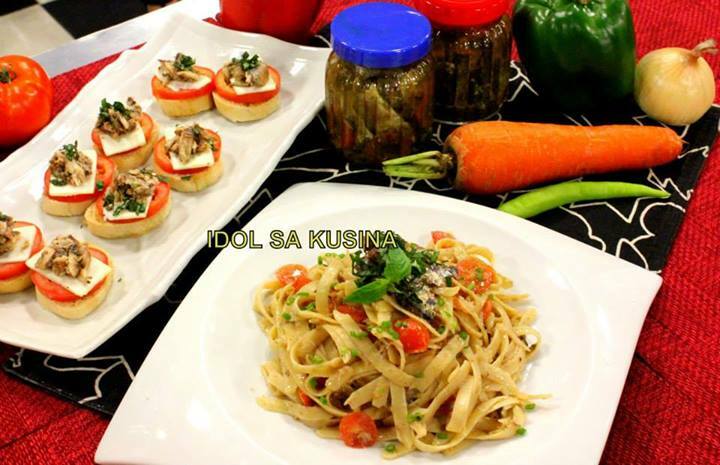 Here's Idol sa Kusina Recipe for Episode 97/June 16- GOURMET HERRING (ON PASTA OR BAGUETTE WITH KESONG PUTI AND BASIL). 1. Combine salt and water. Soak cleaned fish for 10 to 15 minutes and drain. 2. Arrange fish in a pressure cooker. Add the rest of the ingredients. 3. The amount of liquid should be enough to cover the ingredients. Add more oil if necessary. Cook for 45 minutes to 1 hour or until fish is tender. 4. Place fish in sterilized bottles until ready to eat. 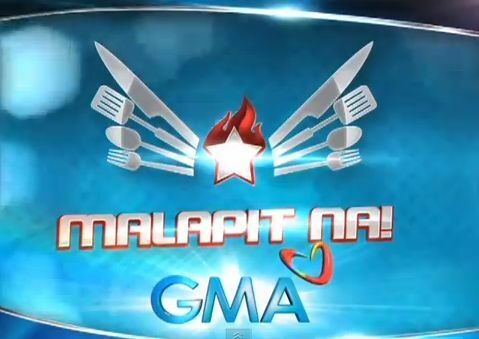 Catch “Kuwentong Kusina, Kuwentong Buhay” on ABS-CBn hosted by Toni Gonzaga. Together with a guest Kapamilya star or celebrity chef, Toni will prepare specialrecipes from San Miguel Pure Foods for the featured letter sender's whole family. 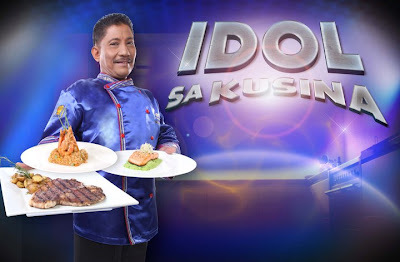 “Kuwentong Kusina, Kuwentong Buhay” fulfills not only the wish of one lucky Kapamilya weekly but will also grant the longtime dream of Toni to showcase hercooking skills. Not too many people know that Toni took a culinary arts coursebefore plunging full-time into showbiz. 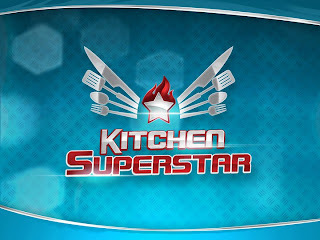 The program will also feature different culinary spots in the country, with Kapamilya stars and celebrity chefs preparing the cuisine specialties of their respective hometowns with Toni. 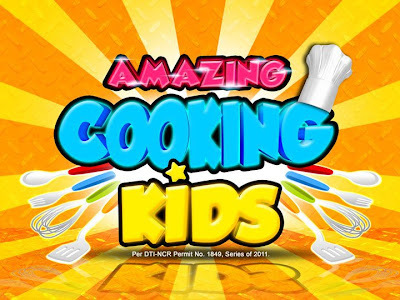 Don’t miss “Kuwentong Kusina, Kuwentong Buhay”every Sunday, 9 AM on ABS-CBN. 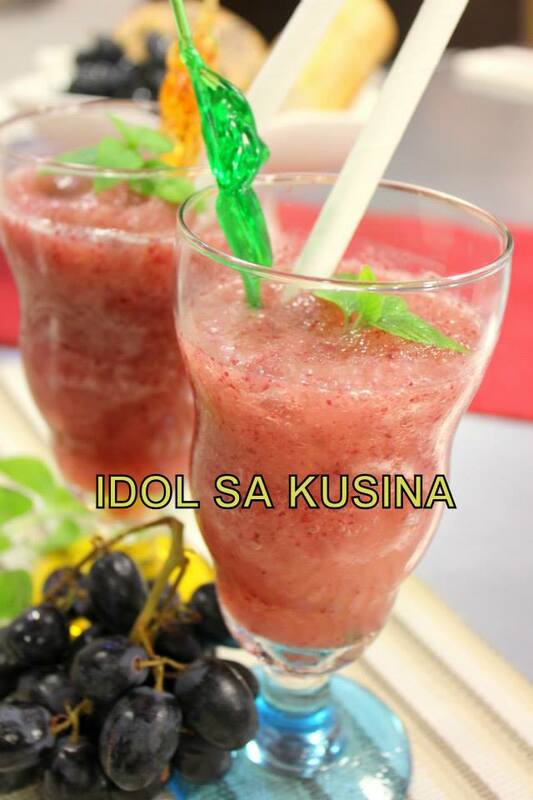 Here's Idol sa Kusina Recipe for Episode 96 /June 9- GRAPE SLUSH. 1. Place everything in a blender and serve. 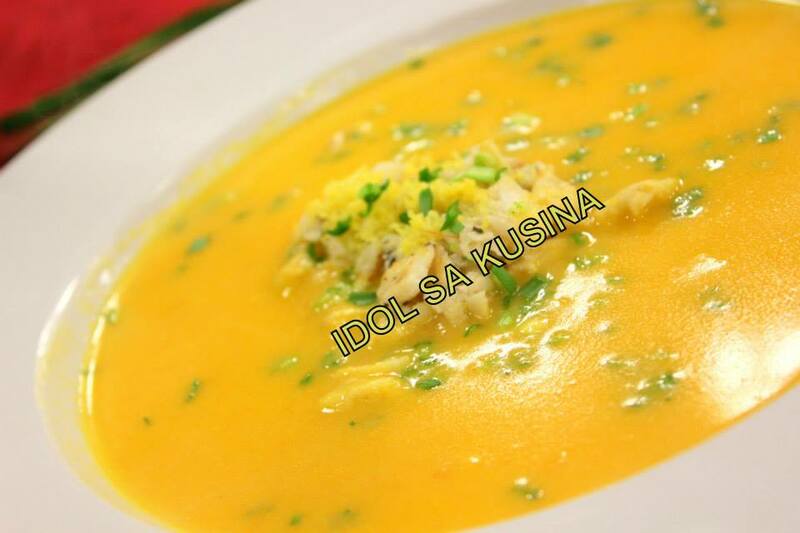 Here's Idol sa Kusina Recipe for Episode 96 / June 9-CARROT AND CRAB SOUP. 1, In a pot, melt butter and saute' onion, carrots, bay leaf, white rice, salt, black pepper and cumin. Cook, stirring, until onions are soft. 2. Add 5 cups water and bring mixture to a boil, then reduce heat and simmer for 25 minutes. Remove bay leaf. 3. Puree soup in a blender until smooth. Return soup to pt, stir in lem on zest, and heat again. 4. In a small bowl, toss crab with lemon juice and minced chives. 5. Put crab mixture in the center of each bowl, then ladle soup. 6. Garnish with chopped chives. 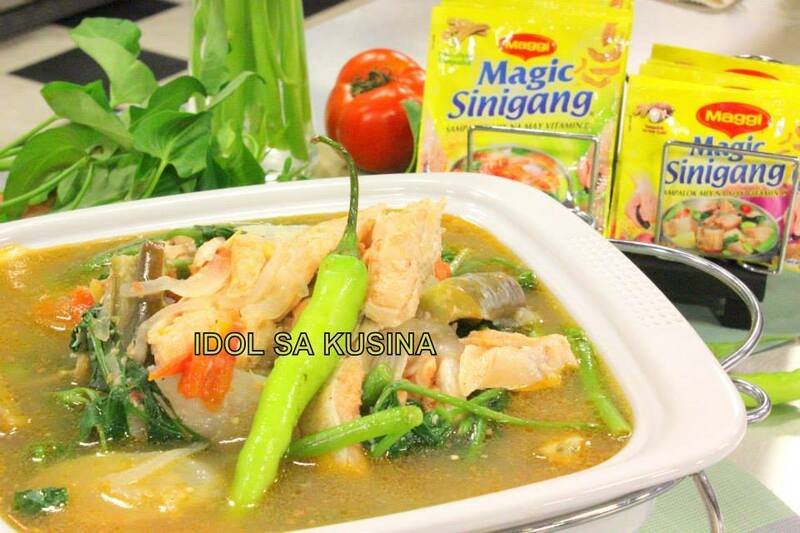 Here's Idol sa Kusina Recipe for Episode 96 /June 9- MAGIC SALMON BELLY SINIGANG. 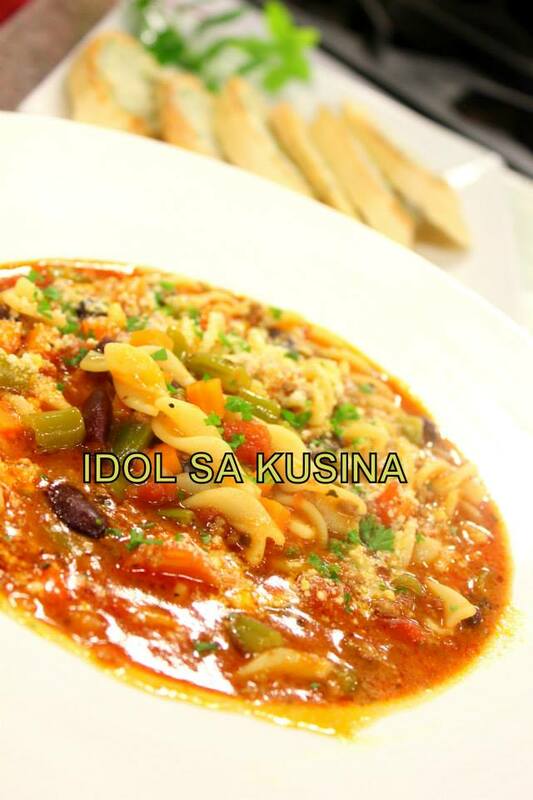 Here's Idol sa Kusina Recipe for Episode 96 / June 9- HEARTY TOMATO SOUP WITH BONE MARROW BAGUETTE. 3. Add in chili powder and stir in tomato sauce, whole tomatoes with juice, water. 4. Add in kidney beans, green beans and season with salt and pepper. Simmer for a few minutes. 5. Make bone marrow spread by mixing marrow, lemon zest, parsley, salty and pepper and lightly spread on toasted baguette. Set aside. 6. Mix in the cooked pasta until heated through. 7. Ladle into bowls and sprinkle freshly grated parmesan cheese on top. 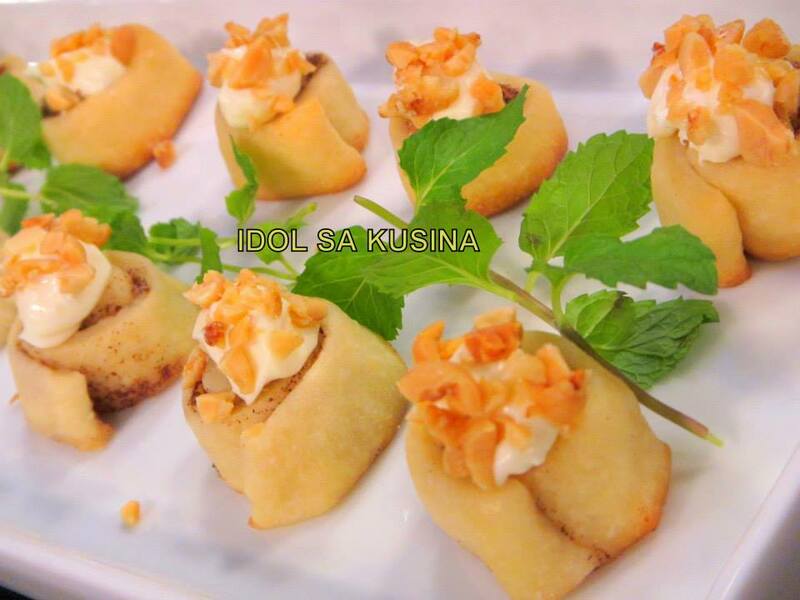 Here's Idol sa Kusina Recipe Ep. 95 / June 2- MINI CINNAMON ROLLS. 2. In a large bowl mix together flour, sugar, abking powder and salt. 3. Add in softened butter. 4. Stir in milk to form a soft dough. 5. Roll out dough on a lightly floured into a rectangle about 1/4 inch thick. 6. Spread the remaining filling on the rolled out dough. 8. For glaze, combine powdered sugar nuts and milk in a small bowl and stri until smooth. 9. Once rolls are finished, drizzle on glaze and serve warm. 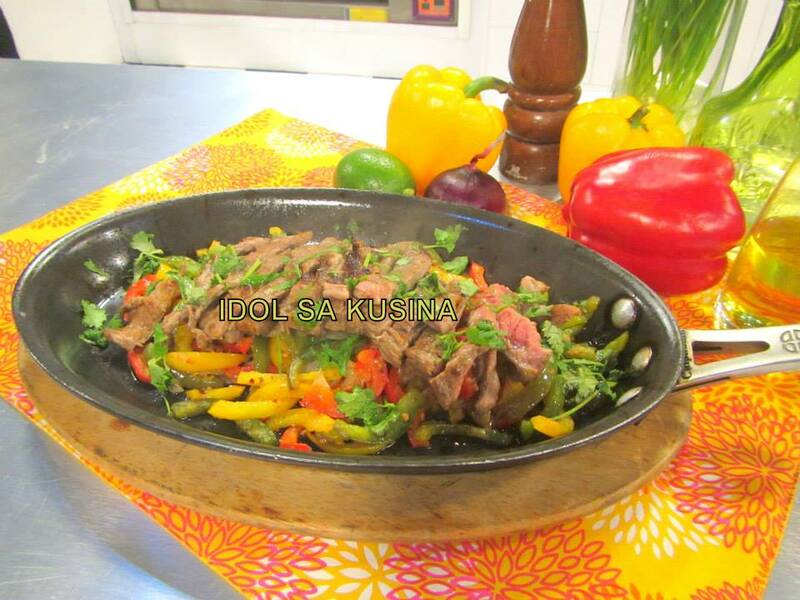 Here's Idol sa Kusina Recipe for Episode 95/June 2- SIZZLING BEEF FAJITAS. 1. In a bowl, whisk together the lime juice, tequila, garlic, cilantro, 1 tbsp of the oil, Worcestershire, oregano, chili flakes, cumin and coriander. Pour into a large zip-lock bag, add the steak, and seal. Chill for a few minutes. 2. Meanwhile, in a large skillet, heat the remaining oil over medium-high heat. Add the peppers and onios, and cook, stirring, until soft and slightly caramelized. Add the garlic and season with salt and pepper. Set aside. 3. Toast the tortilla and set aside. 4. Grill the marinated steak and slice into strips. 5. Arrange everything on a sizzling plate. Place the beef first, then top with the sauteed vegetables and serve with toasted tortillas and lime wedges. 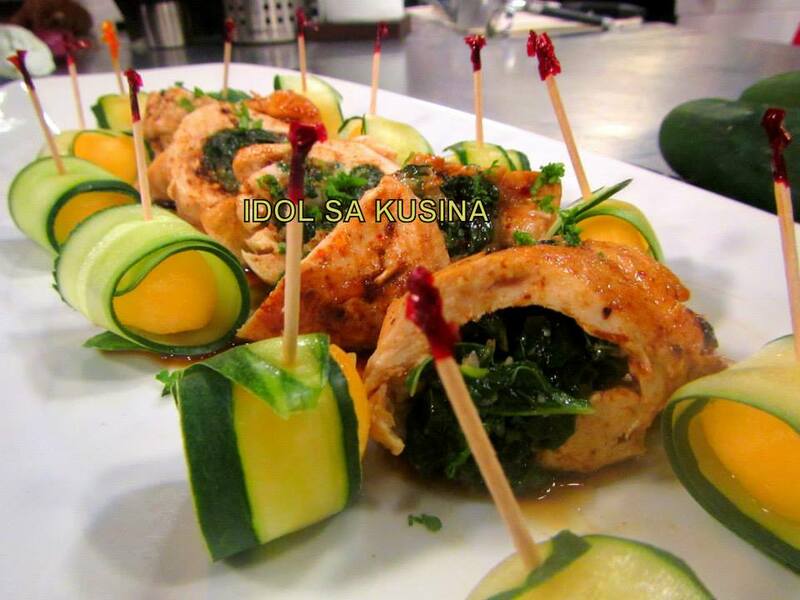 Here's Idol sa Kusina Recipe for Episode 95 / June 2-SPINACH CHICKEN ROULADE. 1. Heat spinach in saute' pan. Transfer to strainer and press firmly with back of spoon or squeeze to remove excess moisture. Set aside in bowl. 2. In the same pan, saute' onion, garlic and chili flakes. Cook until onions are soft. 3. In a small bowl, stir together onion mixture, chese and spinach. 4. In another bowl, combine tomato sauce and balsamic vinegar. Then spread alayer on top of the chicken and then add the onion and spinach mixture. 5. Roll the chicken tightly and secure with wooden toothpicks. 6. In a pan, brown the chicken on all sides. Add white wine and cover, cook chicken until done. 7. Slice chicken diagonally and drizzle with pan juices, garnish with parsley and serve.